Anilox volume refers to the carrying capacity of an anilox cell, or the amount of ink held in each cell, during Flexographic Printing. It is one of the many factors that determines the amount of ink that is transferred to the print material, and therefore has to be accurately controlled and measured. The function of the anilox is to measure and control the volume of ink delivered to the image carrier. 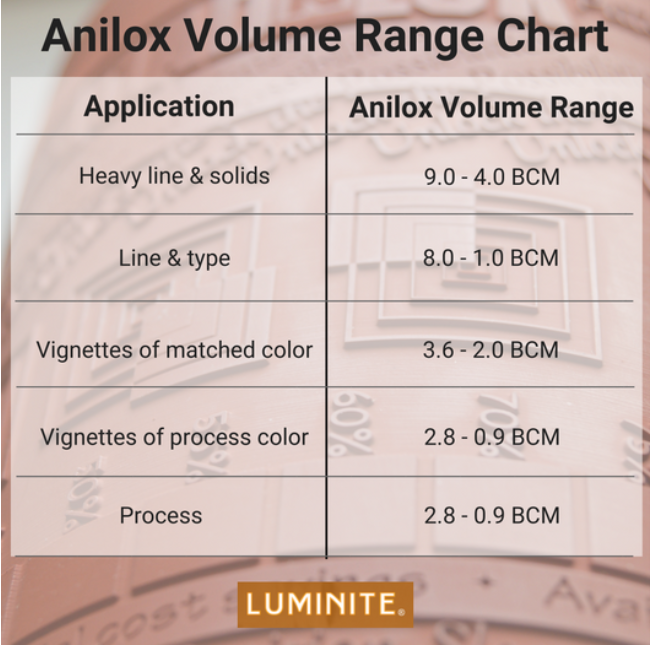 The amount, or volume, of ink that is transferred to the image carrier is dependent on the size and number of engraved cells that are on the anilox, as well as the ink that is used. This cell volume determines both the amount of ink the image carrier receives, as well as the density of the resulting ink. Cell carrying capacity is measured in Billions of Cubic Microns (BCMs). Microns are very small units of measurement; with a human hair actually being 70 microns thick in diameter. Cell volume is expressed in billion cubic microns per square inch, or BCM/in². Some of the conventional anilox cells measuring tactics include microscopic measurement and liquid volume measurement. It is often beneficial to print with the thinnest ink film possible, and this has to correlate with your anilox volume for best results in your specific type of operations. High anilox volumes give high solid ink density and more color, while low anilox volumes transfer less ink to the image carrier, resulting in sharper graphics. When you try to print with high anilox volumes, it will be difficult for you to achieve optimum flexographic printing. Thin films of wet ink, on the other hand, make it easy to control the printing process. They enable you to reduce dot gain, achieve smaller dots, sharper edges, and ultimately cleaner printing. One of the most important factors to take into account when printing is the anilox volume and line screen interaction. A printer must be able to get the right combination of these two factors for their anilox roll to fulfill their specific printing job’s needs. A banded anilox is one tool that print operators can use to test and determine the correct set-up to deliver adequate color strength and still print the thinnest ink film possible. With the modern manufacture of high strength inks and small carrying capacity cells, printing operators can now use higher line screen anilox rolls to produce higher line screen graphics (such as using an anilox volume of 1.0 BCMs for a 1,000 anilox line screen). All in all, in addition to learning about anilox volume, it’s prudent to have some understanding of line screen and anilox rolls. Note: A good rule of thumb for determining line count on an anilox, is to make sure the line count is minimum of 6 times that of the line screen in your image carrier design. However, this is not a “one size fits all rule” and it is always best to ask your anilox provider to find out what is best for your print. Is It Time to Replace Your Anilox? Anilox cell volume changes over time because of factors such as dirt or wearing out of anilox rolls. It’s important to measure the volume of your anilox periodically to monitor for wear and tear and ink plugging that can affect performance. Some of your print defects may be a result of your anilox simply needing to be cleaned or resurfaced. If the cells are dirty or blocked, color, and cell volume may be restored with a thorough cleaning. But if their wear is permanent, they need to be resurfaced or replaced to avoid lower quality printing.